Chandler 4 Corners is bolstering their offering of canine-themed home accents with 18 new charming designs. "I’ve always had dogs, I love them, and I don’t think anything makes a house feel more like a home than a tail wagging dog!" Home accents leader Chandler 4 Corners, known for hand-hooked wool throw pillows and rugs, is growing one of its most popular motifs: Dogs. The new home accents, designed by Laura Megroz, bolster Chandler 4 Corners’ already impressive collection with 18 new dog-themed home accents for customers to discover. 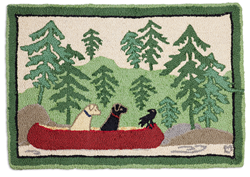 Dogs abound on Chandler 4 Corners canvas pillows, hand-hooked wool rugs and runners, footstools and of course Chandler’s hooked wool toss pillows. There are small dogs, such as the happy Jack Russell Terriers, Dachshunds, and West Highland Whites, as well as many big dogs like Labrador Retrievers, Golden Retrievers, and more. To see all the dogs of Chandler 4 Corners visit their website here. Many people take advantage of the personalization opportunity. They select one of the pillows available to be personalized—many have dogs on them—and they put their pet’s name on it, or that of a friend’s pet, and create a very personal gift. Since 1991, Chandler 4 Corners of Manchester Vermont has been committed to their tagline, Accent Your Life, providing enduring connections through their hand-hooked wool pillows and accent rugs for the home accent industry. Selling to top retail and catalog companies throughout North America, they best known for the fun and nostalgic designs of Laura Megroz. Today, with over 500 products to choose from, the company has expanded into canvas pillows, 100% wool flatweave rugs and accent furniture. In 2015, they unveiled the rug collection of folk artist Judith Riley, “The Woodstock Collection”. For more information, please visit chandler4corners.com.